In Scotland, remand prisoners make up 18.7% of our prison population yet, it has been revealed, they count for 27% of the deaths in custody. The most common cause of death is suicide. Scotland’s use of remand seriously undermines the integrity and equality of our justice system. The large majority of those people were not found guilty of any offence, but remanded awaiting trial. In fact, 15% of the Scottish prison population are remanded into custody without conviction. 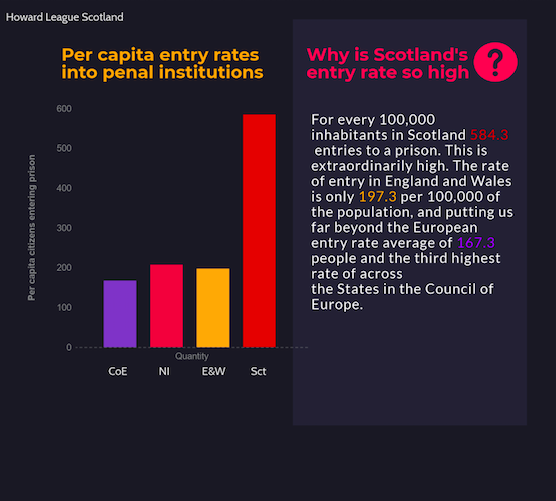 The high rates of remand are one of the causes of Scotland's staggeringly high prison population, and therefore remand contributes to Scotland’s reputation as one of Western Europe’s most punitive nations. In England and Wales the use of remand is dropping (where 11% of the prison population is on remand), but in Scotland the remand population has been steadily increasing for decades, with an increase of over 60% since 1998. Furthermore, the Scottish courts use of alternatives to remand custody, such as supervised bail, have been falling. That, as it has now been reported, being on remand disproportionately increases a person’s chance of dying while in custody should give the Scottish government greater impetus to severely restrict the court’s use of remand. Yesterday’s headlines carried the good news that prisons in England and Wales will have in-cell phones installed this year. This is an important penal reform that will improve the quality of life for prisoners in England and Wales, but it also casts a critical light on Scottish prison policy and how and why we might now wish to emulate this development. The possibility of in-cell phones was tentatively proposed in Scotland in 2013, but received little public and political backing. It seems that this issue has not been explored any further since then. Until recently Northern Ireland was the only UK jurisdiction to provide people in prison with in-cell landlines. Now, however, as England and Wales move forward with this prison reform Scotland will be left behind, soon to become the only prison system in the UK that does not provide prisoners with landline access inside their cells. The dominant and prevailing argument given in support of providing prisoners greater access to private and affordable phones is that it will increase rehabilitation and therefore reduce crime. This is because there is a great deal of research suggesting that family contact helps reduce recidivism. However, should our prison reform aspirations be limited to rehabilitation and desistance? We know that prisons are isolating for prisoners. Prisons have restrictions on when and how often prisoners can receive visitors; and in Scotland, where prisons are often widely dispersed across this vast nation, actual family contact can be more difficult to maintain than it might immediately appear. This makes phone contact all the more important. For the time being, however, in Scotland prisoners’ calls will continue to be made on public phones on public landings – where private conversations, family matters, and any and all news will still be received in full view and within earshot of other people. At the very least, this makes maintaining genuine and meaningful conversation with those outside the prison much more difficult. Insufficient family contact is part of what causes suffering for prisoners beyond the deprivation of liberty, and therefore the justification for more landlines in prison cells runs deeper than reducing crime. In addition, we should never treat families merely as a tool to be used to support prisoner rehabilitation, particularly given the corrosive impact the prison can have on their lives. While they themselves are not imprisoned, the prison usually comes to dominate their family life. Having a family member in prison can cause anxiety, shame and stigma, deepen social and economic marginality, and having a parent imprisoned can yield particularly devastating consequences (Wakefield and Wildeman 2014). As one of Scotland’s leading experts on imprisonment and its wider impact on families, Dr Cara Jardine, has written, given their ‘potential difficulties and vulnerabilities, these families should be offered support as individuals in their own right and not simply viewed as a potential resource for reducing reoffending’. Communication and Well-Being or Rehabilitation? There is a strong general argument for phones in cells. If the Scottish Government, and our New Cabinet Secretary, Humza Yousaf, decide to reconsider the position on prison phones, then they will need to think seriously about why we do it: how the policy works in practice will depend on whether its main rationale is reducing reoffending or to help improve family contact. If a phones policy is to help maintain as normal as possible family relations, then phones in cells will be able to receive incoming calls as well as make out-going calls. In addition, if the Justice Department and SPS are motivated by reducing the problems caused by imprisonment and not merely rehabilitation, then they will need to address how phones are paid for. If we want to lessen the destructive impact of the prison on family life, mental health, and reintegration, then the Scottish Government and the Prison Service must foot the bill for this increased phone contact. As Jas, someone who is currently serving a sentence in a Scottish prison, recently wrote, managing a weekly budget in prison is a careful balancing act, challanged by the same demands of low wages and increased cost of living. But what his account also reveals is the already existing stress for prisoners and their friends and families in financially managing continued contact in Scotland. This is exacerbated by the fact that many of the people in prison are from communities that experience the most acute financial deprivation. As Jas writes, ‘I believe that high phone call costs and low prison wages is a double-edged sword that makes the SPS’s literature of ‘encouraging positive relationships’, less achievable’. Therefore, the current cost of phones in prison means people are already limiting their family contact, and thus undermining the health and welfare of the entire family. Now, add into this existing situation the possibility of increased family contact and what the penal system will also inadvertently create is additional anxiety about not being able to afford to maintain contact: it would cost £1.30 per day for a prisoner calling home every day for just ten minutes to a mobile, multiply this by 7 days and it would cost £9.10 per week (which is more than some prisoners wages). Therefore, if this policy is about maintaining family contact and lessening the harm caused by imprisonment, then HLS advocate that in practice phones will need to be affordable and flexible. The Scottish Government, should they now decide to also follow the present progressive trend and install phones in prison cells, should do so because it helps make prisons more humane, softening the sense of isolation a prisoner feels and may make reintegration less difficult. Secondly, the government should also consider this a worthy and vitally important venture because of the wider social impact of improved prisoner contact. The Scottish government already acknowledges that the families of prisoners suffer collaterally in ways that can cause lasting damage. If we wish to limit the unintended injustices of the Scottish criminal justice system, then increasing the opportunities for normal family contact must be made a priority for prison policy in 2018. It is time for Scottish prisons to reconsider the issue of phones in cells, but we should also do so for the right reasons. Rehabilitation is an important aim for prison policy, but we need not narrow the rationale behind progressive reforms to reducing reoffending. Instead, prison policy makes its most progressive and socially just impact when it attempts to transform the prison by reducing the detrimental effects of imprisonment on prisoners and society alike. Mills A. and Codd, H. (2008) ‘Prisoners’ Families and Offender Management: Mobilizing Social Capital’, Probation journal, 55(1): 9-24. The Council of Europe today published their Annual Penal Statistics – Survey 2016. The report reflects detailed information from 47 of the 52 prison administrations across the Council of Europe. This has revealed a slight increase in the total size of the prison population across these jurisdictions, rising by 1%, the Council of Europe average prisoner population is 117 prisoners per 100,000 people. This report is also important because it allows us to see where Scotland sits in relation to penal trends in other countries. Matters we should be worried about include the revelation that Scottish prisons have the highest mortality rates within the UK. They are slightly higher than England and Wales and more than double the rate of deaths recorded in Northern Irish prisons. For every 100,000 inhabitants in Scotland there are 584.3 entries to a prison. This is extraordinarily high. The rate of entry in England and Wales is only 197.3 per 100,000 of the population. This puts us far beyond the European entry rate average of 167.3 people, giving Scotland the third highest entry rate of the 47 nations surveyed in the Council of Europe report. The entry rate does not reflect the number of individuals received into prison, but the total number of times someone enters a prison. So this can include the same individual receiving more than prison sentence in a year. This suggests that more people are being churned through the prison system more often than almost any other country. Scotland releases people at a slower rate than the European average. In 2015, 31,300 people entered Scottish prisons and 16,700 people were released. This means Scotland has a turnover ratio of 42.6. This is below the European average of 52.3 and places us in the group of countries with the lowest turnover ratios. The Council of Europe warns that low turnover rates are potentially an indicator of future overcrowding. Scotland is recorded as having one of the shortest average sentences at 2.9 months, this is below the European average of 9.8. Short sentences can help keep prisoner numbers low, but it can also be an indicator that prison is not being used a measure of last resort. However, since the presumption against short sentences was introduced in Scotland this figure is likley to have risen. Scotland has a lower than average prisoner suicide rate, with 8.3% of deaths in Scottish prisons recorded as suicide. Since the figures were collated Scotland’s prison population has dropped from 142 per 100,000 to 139. While this is welcome, the change is likely due to drop in the number of people being proceeded against by the courts rather than reflecting a change in prison policy. To make this change permanent and continuous requires policies that address Scottish punitive sentencing trends, cautious parole practices and long-term prisoner legislation. Scottish Government Justice Analytical Services have released their latest Statisical bulletin. Some of the key figures include a decrease in the fear of crime, a believe that crime is either static or going down; an increase in the prison population and the average sentence length; and an overal decrease in recorded crime. 16.9%: The overall risk of being a victim of crime, which fell from 20.4% in 2008-09, and the estimated number of crimes experienced by adults in Scotland fell by 22% over the same period. 55%: Number of people convicted in 2013-14 who received a financial penalty. 4%: The rise in the average prison population between 2010-11 and 2011-12, to 8,178. This was driven by increases of 9% in the remand and 3% in the sentenced population. 9,500: Current projections for the Scottish prison population for 2020-21. 82%: the percentage of the 19,400 social work order between 2012-13 which were community payback orders.